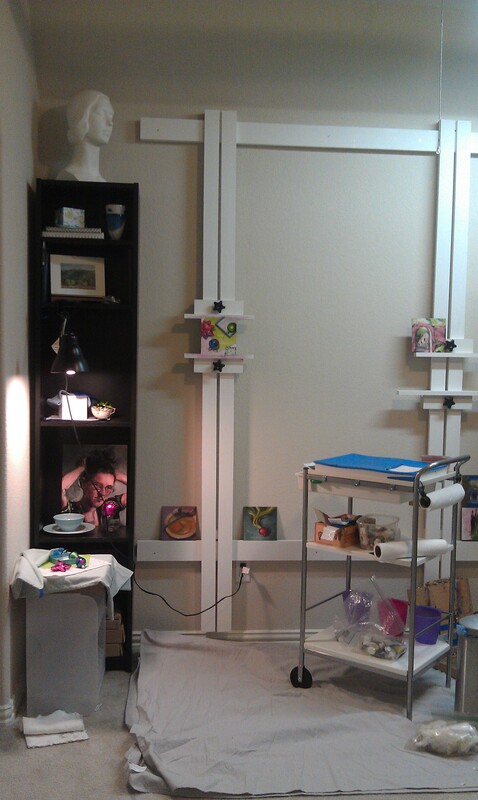 Any studio space requires few specific component: lighting, easel (work space), and storage for materials. Arranging them all to fit the artist needs is quite the challenge, and can drive some of us simply mad.It has been nearly five months since I moved to my smaller blank studio. It has taken me most of that time to research studio setups, build in storage, set up lighting. 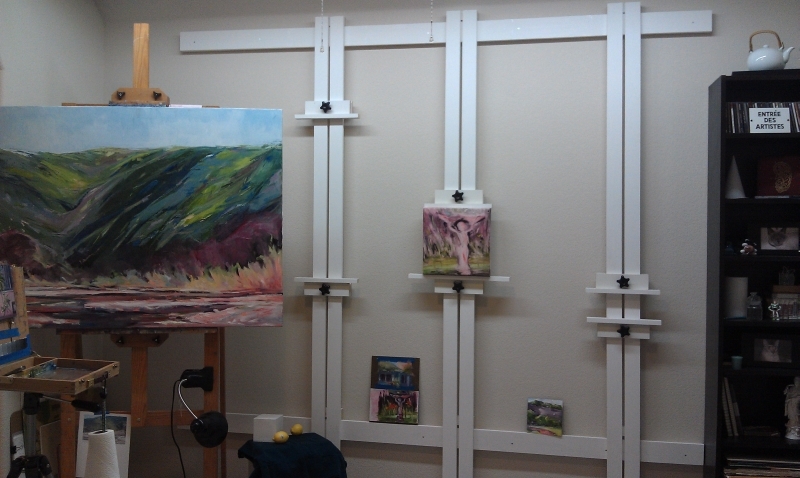 I recently started building in a wall easel to accommodate larger paintings without sacrificing floor space. It is effectively a large 8′ x 8′ easel with multiple vertical masts to accommodate BIG paintings or multiple panels side by side. 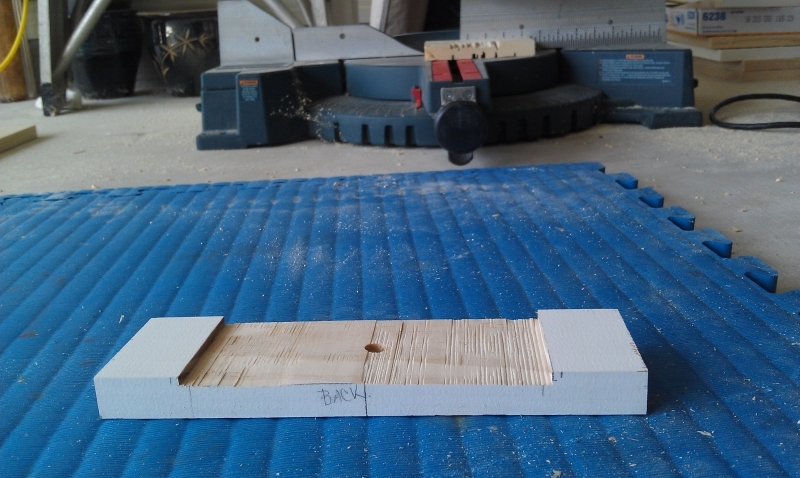 Thankfully, the simpler design requires very few major tools. I did find the auto leveler quite useful for the 8ft expanse. 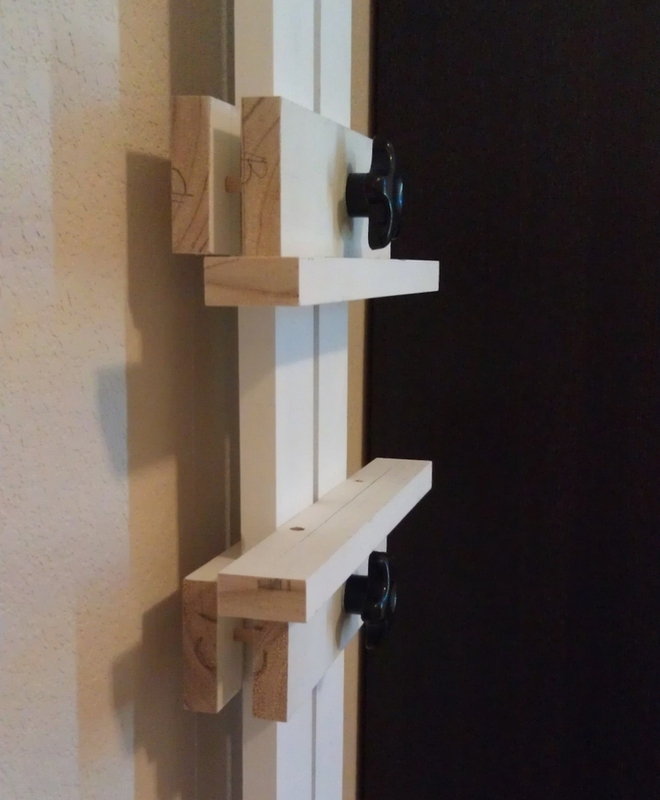 I still need fabricate the bar clamps (awaiting parts), but I am excited about it! The wall easel is quite brilliant and inspired by Jason Tueller http://paperbirdstudio.net/wall-easel/. Meanwhile all this time, I continued to struggle to really get a feel for what my studio space should be. 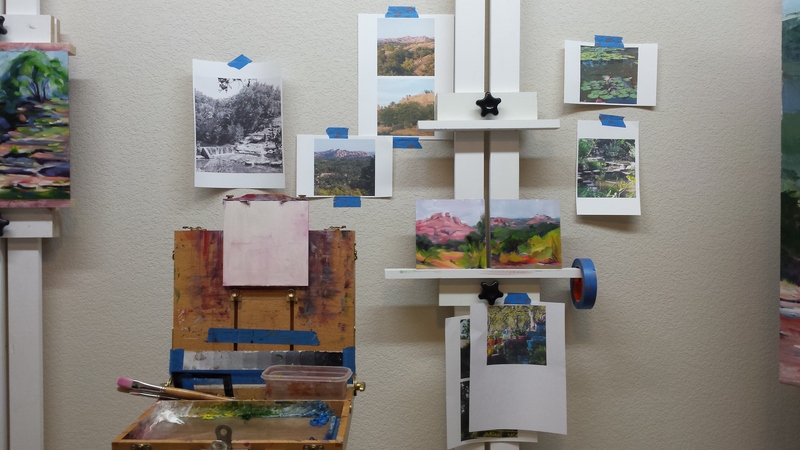 So much to my frustration even after installing the wall easel, my studio still felt out of sorts. I kept turning around to find myself walking back out of the cave, even more frustrated. So this morning, I resolved to flip the layout of my studio in hopes of opening up the space. We took down the wall easel (sanded down any fussy spots) and reassembled it on the opposite wall. This required me to relocate the lighting to the opposite side of my studio. I have also realized I should down size my giant taboret to soon to something more smaller. After much help from my loving husband, I have achieved a better layout and better energy for working. 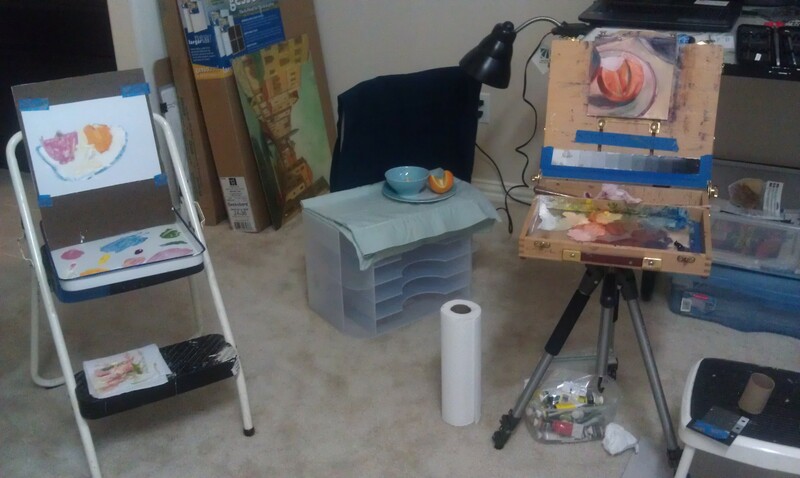 I have room set aside for future still life area,more shelving, a work desk and a resting / thinking spot. 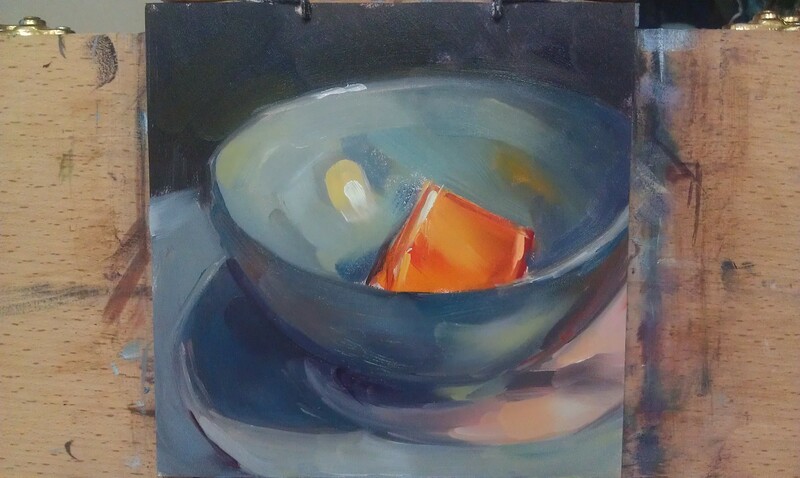 I even worked in a short still life study to find myself positively happy even after whipping it off. 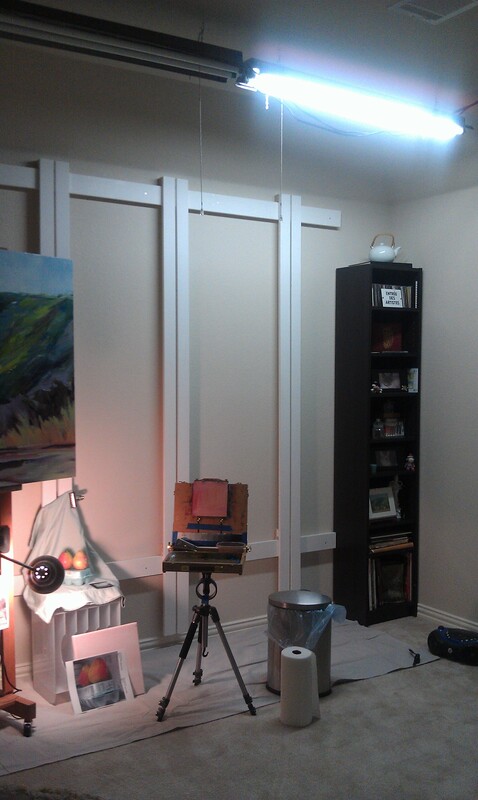 Tonight, the studio feels so much better with open wall space and balanced lighting. Stage 2 for my studio – Lights! Every studio requires sufficient balance of warm and cool lighting. Most painting artists prefer the northern light balance, however, not every studio has norther windows to provide sufficient light. Fortunately, today, fluorescent lights come in a wide range of color spectrum. So it is easier to manage daylight northern light spectrum inside any space with a simple install of light fixtures. Next step was to upgrade my studio lighting. Fluorescent light strips are set! 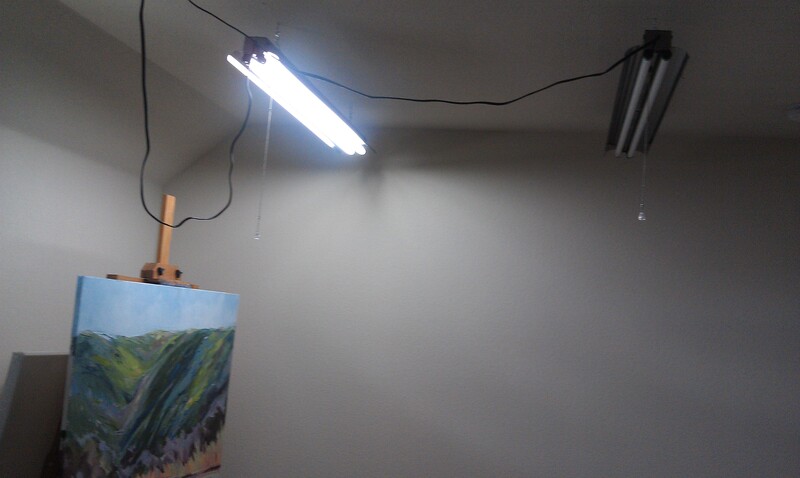 I hung two 4ft fluorescent fixtures to run parallel my easel space. I installed daylight spectrum fluorescent in each fixture. I was sure not to cast multiple light angles or shadows. A giant upgrade from the standard incandescent 6owatt fixture. Side note, Though I love my large window, I soon found that the double pane window was bouncing the natural light as well. So I hung a light blocking drape to better control the light balance. Tah Dah, there will be light! I can accurately mix and gauge true color mixtures! Updated lighting arrangements in next post.. Yay!! I started and finished a new daily painting yesterday!!! Yay! It has been nearly 3 months since I have had dedicated time for painting. I can hardly believe 3 months summer vacation has flown by with home and studio projects here. 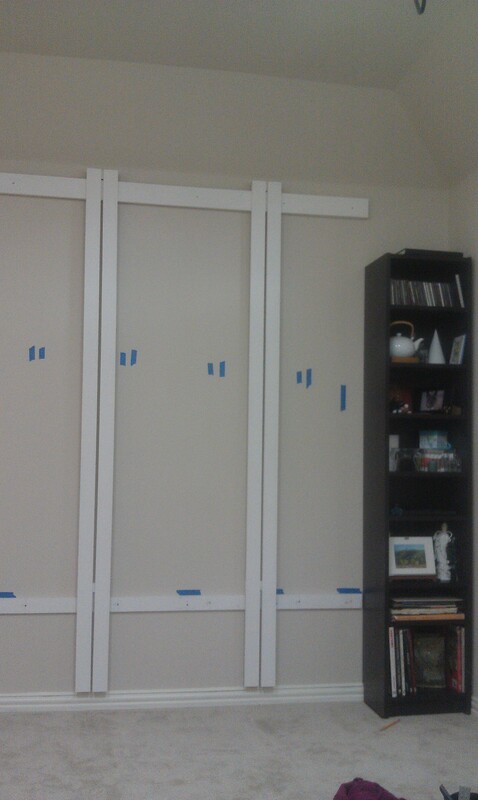 But all the labor is painting off with a studio that is starting to come together. I still have plenty of work to do in there, but I have dedicated work space, dedicated lights, and room enough (I hope) . Space enough to open up my small Easy-L easel and get some fresh painting mixed on a small study. A chance to renew dedicated paint space and times. Yay!!! Moments later… my six-year-old wants to share and paint with mommy – the real paint, too. Hmph. My son declared this past week that my studio was too small and had no room for him to paint. So yesterday’s morning started out slow reconfiguring still life and joint paint space for the two of us. 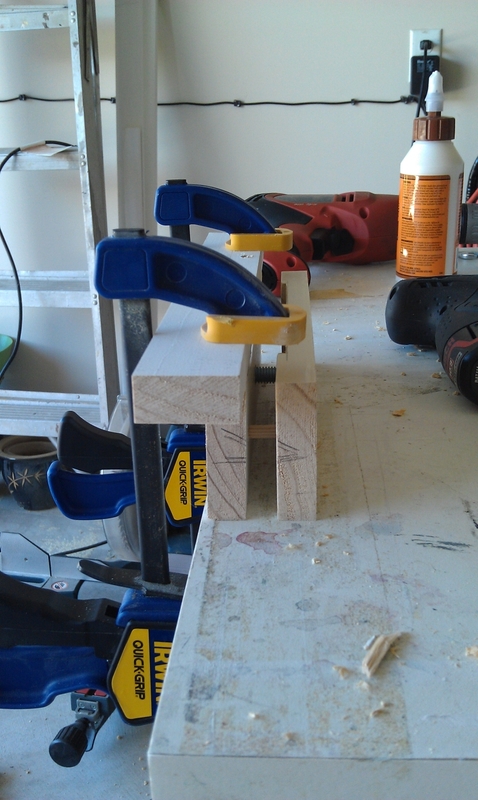 In the pinch, I resorted to using a set stool for his easel set up. Painting and teaching my six-year-old at the same time, not so much. Left brain/ bright brain…Teach or paint, not both in same space / time. I can demo sketching and roughing in the painting for him. So I set to instruct him in minors ways and come back to try painting later in the evening. Accurate paint mixing requires a dedicated right brain activity, to which does not respond well to the chatter. After bath time routine, I did manage to sneak away to my studio. I wiped off the panel, sketched a fresh composition, and set to mixing fresh clean paint. These are what I managed, sketches, painting… etc. Happy start on daily painting here… second start for the day to end the day.